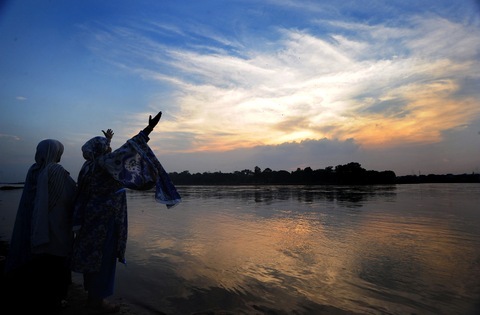 A woman prays by the Ravi river in August 2010, after the worst flooding in 80 years. Photo by Arif Ali/AFP/Getty Images. This week marks one year since historic flooding submerged a fifth of Pakistan and displaced more than 4 million people. In one of Asia’s poorest nations, many of those affected are still without homes or means of income. United Nations agencies say millions need vital aid to rebuild their livelihoods, and 800,000 are still without proper houses, according to a new report by Oxfam International. The emergency tent camps that sprung up outside the flood zones still house 37,000 people, and the displaced are becoming frustrated with the pace of recovery. When the U.N. called for $2 billion in flood aid last year, it was the largest U.N. natural disaster appeal ever, but so far only $1.3 billion has been collected. Aid agencies say the shortfall threatens the ongoing recovery efforts. The United States has been one of the largest contributors, providing $924 million for relief, including transitional shelters, agricultural assistance and disease surveillance, with about $764 million funneled through USAID, a spokesperson said. But U.S. aid to Pakistan has been under a microscope in Congress and elsewhere since Osama Bin Laden was killed while living in Pakistan in May, raising questions about the government’s knowledge of his presence and commitment to fighting terrorism. A bill approved Wednesday by a House Appropriations subcommittee proposes new restrictions on several countries, including Pakistan, requiring the State Department to first verify cooperation in combating terrorism before aid can be committed. The spokesperson said the agency has not changed its approach to aid in Pakistan since bin Laden’s death. One program in particular that came under fire — a $190 million contribution to a Pakistani government program for cash assistance to flood-affected families. As questions continue to swirl about the future of U.S. aid in Pakistan, the timing of assistance from the international community and the gap in U.N. funding is critical, said Javeria Afzal, Oxfam’s coordinator for disaster risk reduction. She spoke to the NewsHour from Pakistan, where it is the rainy season once again. Pakistan did have an emergency response plan in place last year, and is credited with keeping the death toll lower than it could have been at 2,000, but the flooding also revealed the country’s weak points in responding to a chronic flood threat. Afzal said Pakistan lacks disaster preparedness at a community level, there is a lack of coordination higher up at the provincial level, and parallel structures that result in work being duplicated and time wasted exist throughout the system. The severe flooding hasn’t scared people off their land for good though, said Afzal. People want to be gainfully employed and want to be back in their communities. “They very much want to go back to their villages and rebuild their homes and lives,” she said.